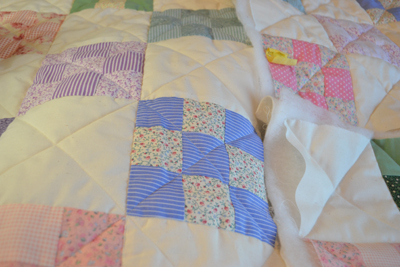 Little House Home Arts: Onto the Next Quilt, Keeping it Simple. Well, Almost! Onto the Next Quilt, Keeping it Simple. Well, Almost! I am using two battings, a low-loft poly to add puff and a cotton under that. I am onto the next quilt. It is one that I started but didn't want to finish until I gained more experience machine quilting, and figured out which method of quilt-as-you-go technique I wanted to use. 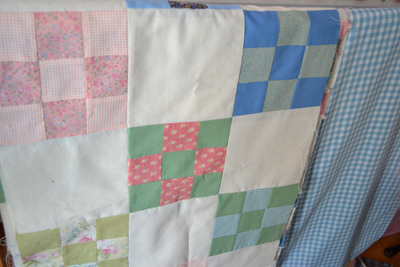 I also experimented with using various battings in my two previous quilts, as I wasn't sure which batting to use. I am making this simple scrap quilt out of materials that my girlfriend had sent to me. They were her mother's materials, and they came with beautiful little vintage hand-made baby clothes her mom had made for her and her sister. 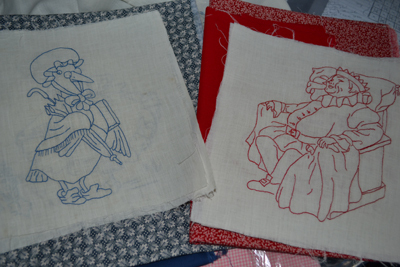 Mother Goose red and blue hand-embroidered quilt blocks were in the package as well. It was obvious what I had to do with these materials and precious items. A simple 9 patch/9 patch top, with a blue and white backing is a start. My plan to quilt the top with battings and then tie the backing to it. 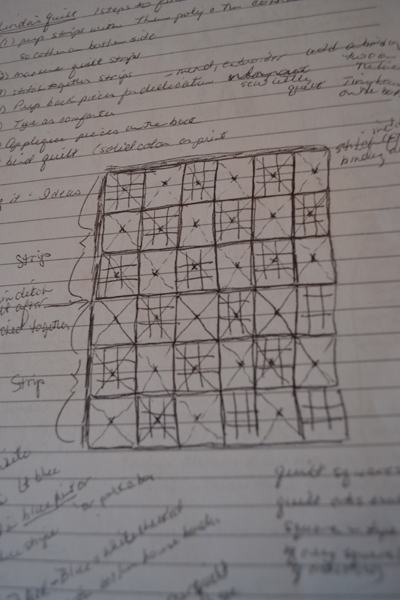 My scrap quilt will be a simple 9 patch/9 patch quilted comforter. I am using two layers of batting, a thin polyester batting with a more substantial cotton one beneath that. This is to get more "puffiness" than using only the cotton batting. After machine quilting this "quilt sandwich" combination, I will hand-tie the two-pieced backing to it, with the blue ties on the front side. I wanted the backing to appear to be a whole cloth backing, though it will have one seam joining two pieces of the same material and this seam will be covered by a hand-appliqued brown bias strip to represent the lower clothesline. Except for little blue yarn stitches, the blue and white checked background will offer "an empty canvas" for the rather elaborate appliqued-design making this a reversible quilt. 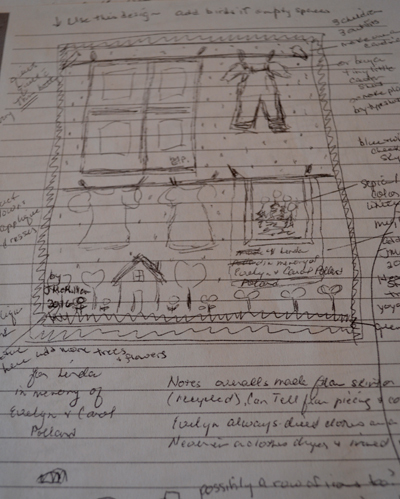 The sketched scene on the back of the quilt will be hand appliqued catching only the backside with my hand stitches and not showing on the front side. Have I ever seen this done before? The answer is "No". My work remains original and I am learning as I go and praying that this looks the way I want it to look when it is all finished. The appliqued design on the back will feature the special items that were hand-stitched and embroidered by my friend's mother, along with my own appliqued items of a little cottage, little heart-shaped flowers and trees, and some appliqued birds on the clotheslines along with a personalized dedication to my friend in memory of her mother and sister. The backside will be an elaborate appliqued dedication to my friend's mother. My mother's friend just happened to love to wash clothes and hang them out on the line. She never owned a clothes dryer! My friend's mother was "near perfect" and loved by all, and so additions of heart-shaped trees and flowers will add the touch of sweetness that fits her. I am learning to focus on completion of this piece in lieu of perfection! My goals in this quilt will be to finish it in a timely manner (by Christmas, I hope), practice my straight line and stitch-in-the-ditch machine quilting, "perfect" a batting combination that will add dimension to my simple quilting/tying and practice hand-applique that won't show on the front side of this quilt, and last but not least pay tribute to my friend by using her mother's materials and hand-sewn items in this special friendship quilt. My process will be interrupted only by prepping for my craft shows that start in October and go through the holiday season. I don't have a moment to lose!! 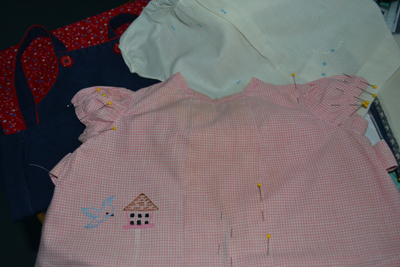 Prepping the little garments to be appliqued to the clothes line. Little hand-embroidered quilt blocks to make a mini-quilt to hang on the line.